A buddy of mine at one time owned an old ‘portable’ CD player in name only. Smaller than the actual CD, the payer operated by spinning the disk in the open air. As the disc passed the enclosed portion the laser read the CD and sent the music to attached speakers or headphones. Of course, the fact that the CD was spinning furiously meant you could not move it while it was playing. Yes, it may have been as small as an iPod, and yes, it did actually play CD’s, but it may as well have been a stationary player. 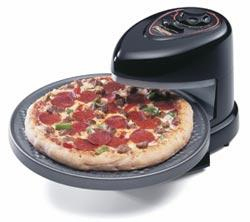 Despite instantly reminding me about a ridiculous concept for a portable CD player, the Presto Pizzazz Pizza Oven , rates surprisingly high in customer reviews at Amazon. The rotating pizza oven (with ‘RotaBake(TM) technology’) has top and bottom heating elements for precision baking control. Self-rising pizzas can be baked by running the bottom element first before turning on the top element. If you like your pizza with a crispy crust, that can be achieved by letting the bottom element run for a little longer. Clearly designed for the frozen pizza market, the oven looks like it might be able to step up to the task – like a half-useful portable CD player.